NEW YORK (Reuters) - Even by the standards of New York's American Museum of Natural History - home of an enormous blue whale model that draws visitors from around the world - this is big. A new, 122-foot (37-meter) dinosaur skeleton to be unveiled on Friday is too long to fit in the fossil hall and so its neck and head will poke out toward the elevator banks, offering a surprise greeting when the lift doors open. 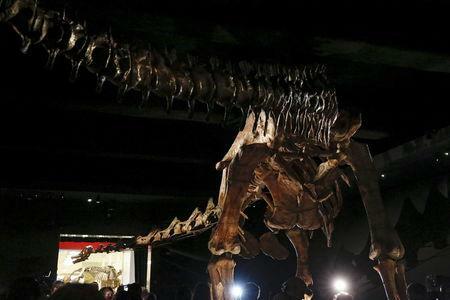 The dinosaur, so recently discovered it is not yet formally named, is so tall that the cast of its skeleton grazes the museum's 19-foot (6-meter) ceilings, the museum that featured in the 2006 "Night at the Museum" film said in a statement. Paleontologists have inferred that the dinosaur, a giant herbivore that belongs to a group known as titanosaurs, weighed about 70 tons — as much as 10 African elephants, the statement said. One of the largest dinosaurs ever found, the species was discovered in 2014 in Argentina's Patagonia region, where titanosaurs roamed the forests about 100 million years ago. 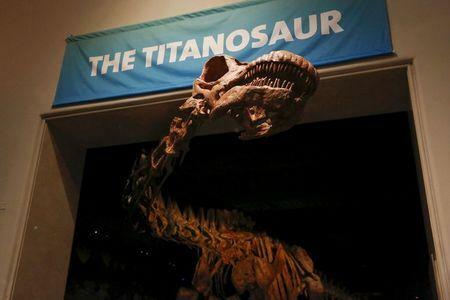 “Titanosaur fossils have been unearthed on every continent, and an abundance of discoveries in recent years has helped us appreciate the deep diversity of this group,” said museum official Michael Novacek. Experts said the biggest threat posed by gargantuan plant eaters was being stepped on. The titanosaur's remains were excavated in the Argentinian desert near La Flecha by a team from the Museum of Paleontology Egidio Feruglio led by José Luis Carballido and Diego Pol, who studied at the New York museum. They were responding to a tip from a rancher who noticed the fossils on his land. 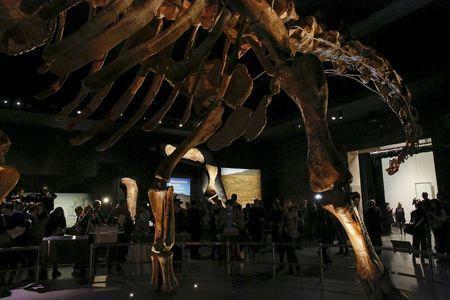 One enormous femur found at the site will be among five original fossils temporarily on view with the titanosaur, the museum said. There are other giant beasts housed at the museum - including an actual mummified woolly mammoth that lived about 11,000 years ago, according to the museum website. Among the biggest hits with visitors are the Tyrannosaurus rex, with its 4-foot (1.2-meter) long jaw and 6-inch (15-cm) long teeth, and the blue whale, a 21,000-pound (9,525-kg) fiberglass model that is 94 feet (29 meters) long.